The perils of food and dairy logistics are rather obvious for those in the industry: Mess up any one factor and a truckload of perishables may easily become a huge pile of waste. Depending on the size of your business, any challenges arising in the delivery of produce between you and your suppliers may mean huge losses, customer dissatisfaction and problems with customer retention and brand loyalty. For temperature-sensitive items, a variation in temperature by just a few degrees could mean a trip to the landfill instead of your business. Fish begins to rot; milk turns sour; lettuce freezes; and candy melts. In some cases, the products may become contaminated with no outward signs, leading to a product recall. A dependable 3PL provider knows the right technology is needed to ensure that your products remain in the ideal environment throughout the supply chain. This means working with regional temperature controlled distribution centres – and close monitoring at the warehouse, dock, and during transport to ensure the products maintain optimal quality from start to finish. If the temperature slips below or above the optimum range, the system alerts the experts for the problem to be corrected. 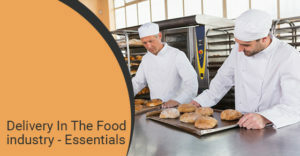 Marketing food products is considered a low-margin business. In order to maximise your profits, you should minimise production costs. To make your operation lean and efficient, you need to get rid of sub-optimised delivery routes, unproductive employees, obsolete refrigeration systems that draw excess power and other measures. Intermodal service: Where the provider offers multiple freight options for optimal efficiency – sea, rail and road, for example. The nature of food products is such that they have an expiry date, and every business seeks to maximise the shelf life of each food item. But there are many different ways to achieve this including expiration date, code date, best used by date, LIFO, FIFO, FEFO, etc. If you get it wrong, you will be wasting space in the warehouse with products that your customers won’t be interested in. Instead, you can work with a 3PL provider that uses a sophisticated warehouse management system that supports a wide array of picking methodologies. This system should be capable of producing images of the remaining shelf life of products in your warehouse, sends alerts for products that are within a predetermined number of days of its expiration date, or list products in order of the oldest code dates so they can be removed first. Ideally, your products should be moving fast enough, but this is a good precautionary measure. Basically, working with a 3PL provider who is experienced with food-grade products will help eliminate delays, wastages, and losses that could arise due to simple mistakes in the supply chain.